I had a chance to speak with Matthew Brown in email after yesterday’s launch of the Fresh Web Explorer from SEOmoz. It’s rare that we write a product review on Outspoken Media, but being both a link builder and an online reputation manager, I felt it was important that I speak up since this new tool combines the best of both worlds! Tracking backlinks and tracking brand mentions are usually very separate affairs. 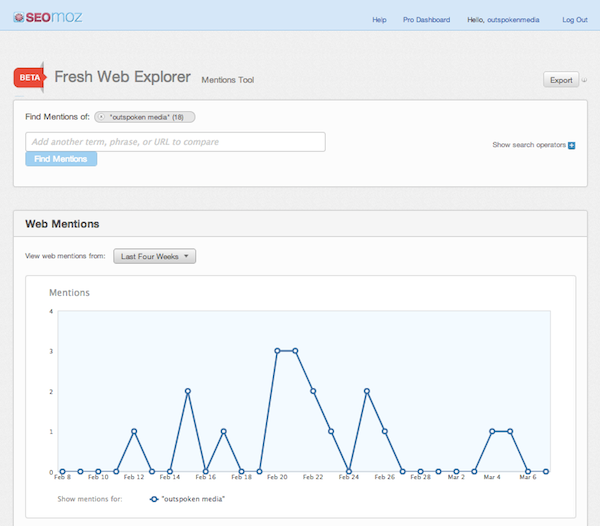 With the Fresh Web Explorer you get the best of both backlinks and mentions or co-citations in one place. The only hitch—it’s just from the past four weeks, so grab your data and check frequently! It also does not appear to include social media mentions, which frankly helps with some of the noise you get in other tools like Radian6 (unless you intentionally block micromedia from displaying in your dashboard). Google Alerts can be buggy, there’s a delay, and there’s often a lot of junk that gets shared. The Fresh Web Explorer (from all of our testing so far) appears to be very accurate. Only in a few instances were mentions not on the page, but these were for low-quality scraper sites that are rotating content frequently. Do you have any pending features you can share with everyone? Do you know how the Freshscape index stacks up against other social listening tools? Are you the biggest and best when it comes to feed count? It’s early to measure ourselves against competitors, either in terms of feed count or quality. 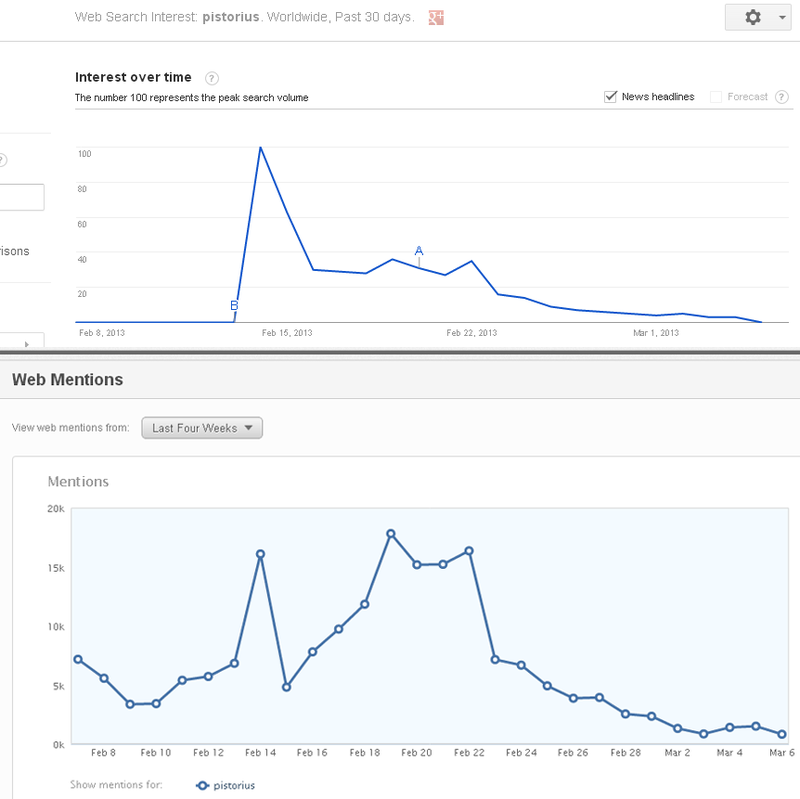 We’re seeing a bit of evidence that we’re consistent with services like Google Trends. For example, here’s a search that a user found for ‘Pistorius’: https://i.imgur.com/eMIsuC9.png – It’s tough to measure against Google’s opaque 1-100 score, but the trendlines match up reasonably well. We’d never expect them to completely match, but the timing and spikes should look similar. What’s the best way for the community to request additional feeds? I know Radian6 allows for a list of other URLs to search for a given dashboard. We’re already looking at mechanisms with which feeds can be added. It’s high up on the feature list. That’s high up in the queue. We wanted to get a high-performing beta release out to our customers before adding on features, which will no doubt require extensive testing. Reclaim backlinks. Sometimes people link to the wrong URL. It happens! Find those mentions and reach out to request an update on the backlink. Build relationships. Use Fresh Web Explorer to identify bloggers who may have mentioned your product, service, or site organically, and now you can thank them for that mention and start to build a real relationship. Ask them how they found out about your brand and if they have any other experiences with it. Ask them if they have feedback on how to make your site or services stronger. Avoid asking them for a link—that’s rude. Befriend them, then ask for the link! Respond to customer service issues. Customer service doesn’t have to be about something negative, but I found a client mention where the blogger said they were eagerly awaiting the catalog, but hadn’t received it, yet. This is a perfect opportunity to get them a catalog (and fast) with a personal follow-up or note to thank them for the mention. Don’t ask for anything, just go out of your way to be human. I guarantee this will have positive results for SEO as well. Spot trends and seasonal change. Matthew mentioned that the Fresh Web Explorer’s only real competitor might be Google Trends. You can do a phrase search to identify recent seasonal mentions and sources. This is a great opportunity to identify potential ideas for content, too. Conduct a competitive analysis/needs assessment. Just like the trend/seasonal change analysis, you can add competitor URLs and track the number of backlinks and citations they accumulated during a peak busy season such as Valentine’s Day or Spring Break. You can use this to inform your SEO and social media strategies, but most important as a way to demonstrate to your superiors the missed opportunities! Build collateral for your brand. Sometimes your customers take better quality pictures of your products than you do. They don’t always take the time to share those with you, but they will share them with their community. Locate amazing reviews of your products online and request to host those pictures on your site as real product shots from customers or as a featured post on your blog. Find customer reviews/testimonials. Just like collateral, customers don’t always share their opinions, especially if it’s positive. Yes, that’s right, your customers will usually only share a life-changing positive experience or a truly awful experience, but they’re not going to go out of their way to share a normal experience. They will however mention to their friends online that they received a sweater in the mail and it was perfect for their new spring wedding dress. Reach out and ask them if you can post their review on your site or blog! Understand social reach. Google Analytics’ new social reports only pick up actual URL shares on social networks like Twitter, Facebook, StumbleUpon, Google+ and even through services like Pocket. Unfortunately, the Fresh Web Explorer doesn’t appear to pull these social mentions, but it will pull mentions from other social sources (i.e. blogs) where content is getting produced as part of a social outreach campaign. Audit brand usage. This can simply be about discovery of brand mentions and how the brand is being used or for the link builders among us… this opens a door to communicate with the blogger/media outlet about the proper usage of the brand. This may actually garner some great backlinks or fixes to a link that might not point to the ideal location. Audit other department/agency activities. Work with/at an enterprise-level organization? You’re probably not the only service provider. Audit outreach strategies of other SEO companies, link builders, PR teams, and social media teams. You might find some really insightful or truly terrifying campaigns. Find paid links. You know what really bugs me? A client who says they no longer engage in paid link activity, but they do! Use the Fresh Web Explorer to identify potential paid links and open the door to a serious conversation about the risk/reward of this method. Audit sponsored posts. Just like paid links, sometimes a particular section of an organization may be engaged in sponsored posts without disclosure or nofollows appended to the URLs. This could seriously hurt your website if Google spots these posts even though they’re just smart branding in the eyes of the campaign manager. Find problems before they become disasters! Find negative SEO. I haven’t seen a ton of this in the wild, but just like paid link identification, you can use the Fresh Web Explorer to find folks who may be building low-quality, high-risk backlinks to your site in the hopes that it will hurt your performance. Have questions about the Fresh Web Explorer? Hit up Matthew on Twitter! For real, they want feedback.